Concluding the return of Zarrko, the Tomorrow Man! And the verdict? Well, just that ... Zarrko's kind of lame. And the future he hails from is, sad to say, kind of dumb. Consider this: In Zarrko's future, some three hundred years hence, everyone is peaceful, contented, cared for and happy - except for this one evil dude. So, naturally, since they have no discontent and no aggressions, they therefore have no weapons or defenses to resist his conquest! The setting honestly seems like a cross between the smiling utopia of DC's Legion of Super-Heroes, and the robot-controlled future of Magnus Robot Fighter. Zarrko's first appearance had been nominally enjoyable, in part because it occurred so early in the Marvel canon; it worked as the kind of 1950s sci-fi story often seen in anthologies like Tales to Astonish, Strange Tales and Journey into Mystery, yet upon further inspection of the details - those details increasingly a part of Stan's new superhero milieu - the constructed world simply doesn't hold up. It's no surprise that it would be another ten years before we'd see Zarrko again! Welcome to ... the future! Along with the utopian scene clashing with the growing realism of Marvel comics, the story is likewise dragged down by the poor use it makes of the space allotted. The lead Thor feature is afforded only thirteen pages for the conclusion of this tale, so you'd think the pressure would be on to use the space economically. And yet the cliffhanger doesn't actually resume and resolve until the bottom of page 3! Instead, the splash page is the "action shot of the story ahead" often used in tales of this era, followed by nearly two full pages of recap. One could argue that the Zarrko adventure required somewhat longer than a 13-page story to tell, and yet significantly less space than a full two-parter. Fortunately, starting with issue #105 the lead feature will finally graduate up to a more full-featured size (generally 18 pages), taking up all of the mag except for the continuing Tales of Asgard. Get this: In the future, they have refrigerators you can fire like a gun! I can't wait to live there. No leftovers will be safe! 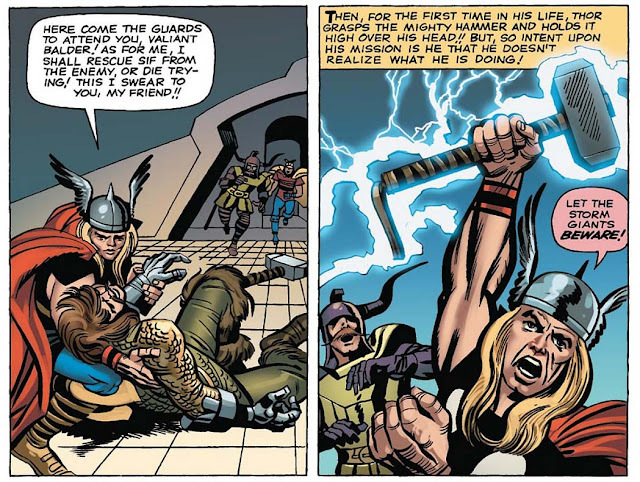 Speaking of Tales of Asgard, this instalment is more significant than most - with as much added import as a 5-page story can deliver, at any rate - as young Thor finally completes the quest that's been in the background of these stories for the past few issues: that of finally earning the right to wield Mjolnir, his mighty hammer! Having accomplished such a feat, he seems far less a boy than before (even though the masthead still informs us he's but 18 years old), and that much closer to the man-god he will become. I love that this one scene sums up Thor as endlessly noble, and sometime dense. 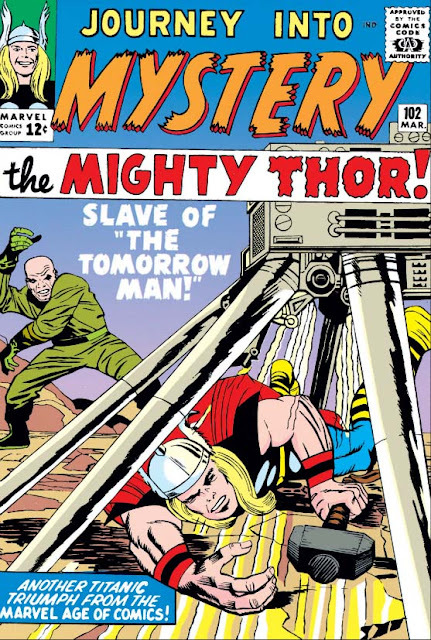 But placing the hammer in Thor's hands is not the only noteworthy claim in these five pages! In addition to that, we also get our first glimpse of a few more of the Asgardian cast, as Thor first consults the Fates on how he can free the captured Sif, sister to Balder (and later to be a rather important figure in his life). To do so, however, he must face the deathly touch of Hela, queen of the underworld! One thing you can't deny: Stan and Jack have really begun to realized the extent to which they can mine all the tales from Norse myth to really spruce up Thor's world. woman we will come to know. 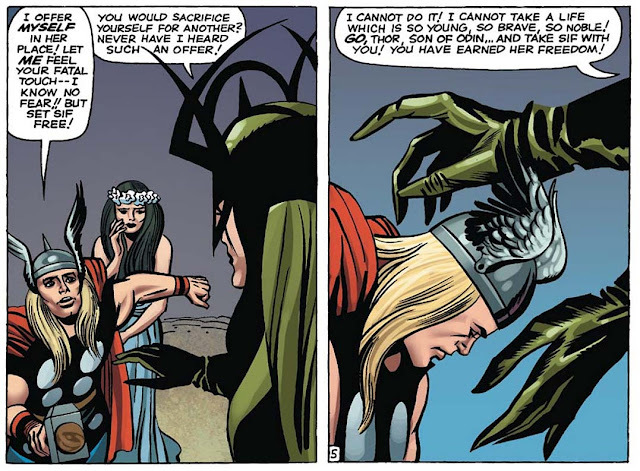 But Hela is already one creepy, forceful being!